BACKGROUND: A key step for increasing the employment outcomes of job seekers with disabilities includes ensuring that employment consultants who assist them have the tools to succeed, including feedback about how they are performing. OBJECTIVE: Supporting employment consultants in their work with job seekers by providing feedback about the implementation of the support strategies recommended in the literature. METHODS: Sixty-one employment consultants completed a daily survey for one year, on their smartphones. RESULTS: Providing supports that lead to hire represented 30% of the employment consultants’ work time. When providing supports that lead to hire, most of the primary interactions were with job seekers (69%), followed by business personnel (12%), and families or acquaintances (3%). Secondary interactions represented another 17% of time with business personnel and 8% with families or acquaintances. The largest share of supports leading to hire were provided in the offices of the employment consultants (41%). CONCLUSION: Employment consultants should be supported in investing a larger share of time in supports that lead to hire, increasing involvement of family members and business personnel, and providing supports in typical community settings rather than in their offices. Migliore, A., Butterworth, J., Lyons, O., Nye-Lengerman, K., & Foos, P. (2018). 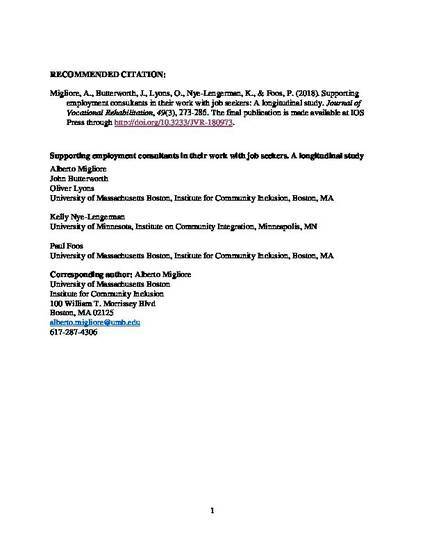 Supporting employment consultants in their work with job seekers: A longitudinal study. Journal of Vocational Rehabilitation, 49(3), 273-286. The final publication is made available at IOS Press through http://doi.org/10.3233/JVR-180973.